Stars: Damian Hill, Ty Perham, Arthur Angel, Tony Nikolakopoulos, Faye Smythe, Kat Stewart, Kaarin Fairfax. 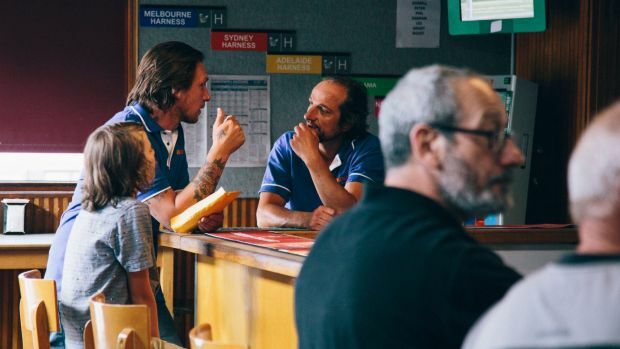 This low budget, rough around the edges Melbourne-shot drama is an exploration of a troubled father/son dynamic shot through with a terrific sense of realism. The film follows the plight of Jim (Damian Hill), an inveterate and hapless gambler with a self-destructive streak who is trying to pay of a $15000 loan to a ruthless loan shark (Tony Nikolakopoulos). He has until five o’clock to pay off the debt or there will be serious consequences. Jim works as a courier driver delivering packages for his company. Because of his gambling habit and his mounting debts he is separated from his wife Karen (Faye Smythe) and behind in his child support payments. His prized possession is the 1970s muscle car that he inherited from his father. Jim’s grand scheme to earn the money through one big gamble on the horses looks set to pay off, until his flawed nature gets the better of him and his plans begin to come unstuck. As the day draws to a close though, Jim and Alec are drawn closer together by their shared experiences, which prove something of an eye opener for the naïve and wide-eyed youngster who learns at first-hand about the hardships of life and the darker side of human nature. Alex also gets to witness his father’s flaws. West Of Sunshine is the debut feature for local filmmaker Jason Raftopoulos, and is essentially an extension of his award winning 2011 short film Father’s Day. But in stretching the original 11 minute short out to 78 minutes its flaws become written large on the screen. West Of Sunshine is a film with big ideas and themes, but few of them are fully developed. There are a few pacing issues as Raftopolous takes his time in taking the characters to places of interest or drama. Hill also previously wrote the superior Pawno, which was set in the similar milieu of the working-class western suburbs of Melbourne. His hapless Jim is also something of a familiar character for the actor and he seems a comfortable fit. However, his performance seems to lack the necessary air of sweaty desperation to make audiences really empathise with his plight. However, there is little to the character beneath the obvious surface details. Newcomer Perham is Hill’s step-son in real life, which adds to the realism of the bond and onscreen rapport they share. The film is driven by the complex and evolving father/son dynamic. Arthur Angel is also good as Jim’s sympathetic best friend and upbeat colleague Steve who refuses to loan Jim any money. The peripheral characters are sketchily drawn. Raftopoulos has cast many locals and non-professionals in small roles here which adds to the sense of gritty authenticity. Raftopoulos stretches his small budget and limited resources. The film looks great thanks to the lensing of cinematographer Thom Neal (his first feature after several shorts and television work) who has captured the familiar streets and back alleys of Melbourne, adding authenticity to the locations. Neal and Raftopoulos avoid the usual nice touristy vistas of Melbourne, taking us into some of the seedier, more grungy areas and giving us a wonderful sense of place. There is a thick and ultimately overwrought and intrusive score from Lisa Gerrard that undercuts the emotional heft of the narrative. This drama set amongst the milieu of Melbourne’s working-class suburbs has a naturalistic feel, but it is not particularly original. Ultimately it also lacks the intensity and explosive drama and undercurrents of violence that filmmakers like Scorsese or Paul Schrader would have brought to familiar material.